Natural killer cell. Immunofluorescent light micrograph of human Natural Killer (NK) cells. 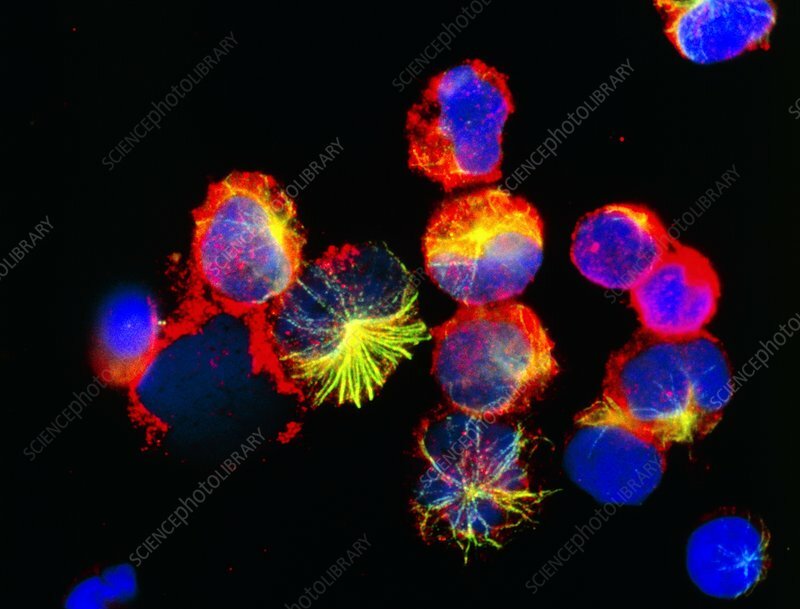 The nucleus of each cell is blue, with the cytoplasm proteins stained green, yellow and red. Natural killer cells are a type of white blood cell known as T-lymphocytes. As part of the body's immune response mechanism, NK cells have the ability to destroy virus-infected cells & tumour cells. On contact with the surface of a tumour cell, the NK cell recognizes certain proteins called antigens, which activate its cell-killing mechanism. Immunofluorescence uses antibodies to attach fluorescent dyes to specific molecules within cells. Magnification: x624 at 6x4.5cm size.